These mini-figures may be small but they are still huge fun! Build WWE champions and kick off a title fight to remember with the WWE Blind Bags. Collect them all and create your own wrestling collection, ready to battle it out with your friends. WWE Superstars available are John Cena ,Roman Reigns, Seth Rollins, Rusev, Undertaker, Ted DiBiase, Dolph Ziggler, Bret Hart, Daniel Bryan and Hart Foundation Bret Hart. Let's get ready to thumb rumble! thumb wrestling game is a thumb wrestling ring. Contenders must insert their thumbs through the opposite corner holes. At the Count of 3, start thumb fighting! pin your opponent's thumb down 3 times to win the match! thumb wrestling game measures 5" x 5" with a 3" handle to hold onto under the ring. "The best there was, the best there is, and the best there ever will be." 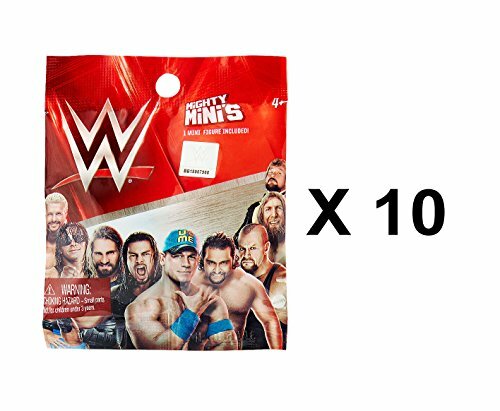 That's what you'll get in this one stop WWE party Favors mega mix value pack. You'll have enough Favors to fill up 8 loot bags! 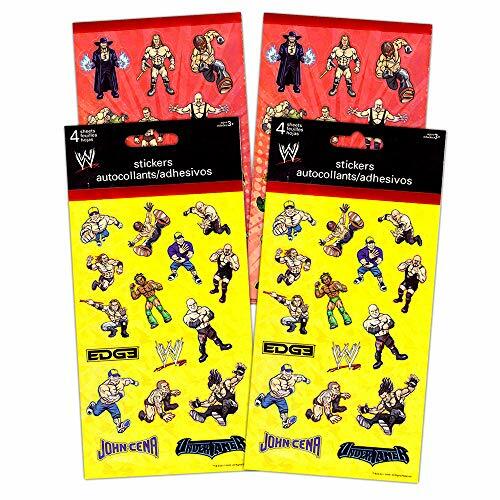 WWE Stickers Party Favor Pack - 124 Stickers. Featuring the John Cena, UnderTaker and other World Wrestling Entertainment favorites! 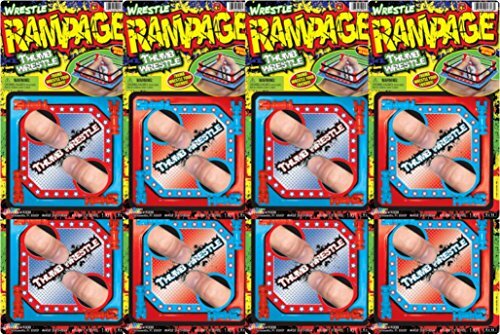 Two individually wrapped WWE sticker packs -- each wrestling sticker pack contains approximately 62 stickers on four sheets (8 sheets, 124 stickers total). Perfect to hand out at parties! Great fun for any WWE and wrestling fan! 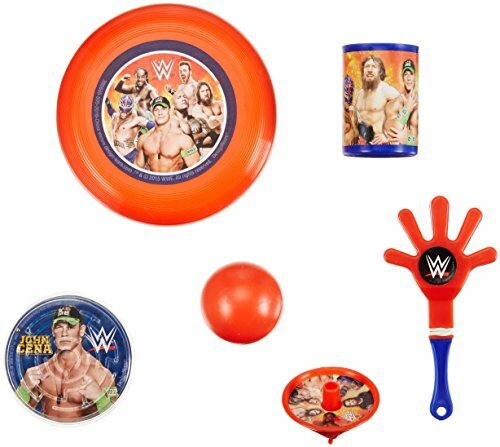 Perfect as WWE party supplies, party favors, reward stickers, motivational stickers and more! 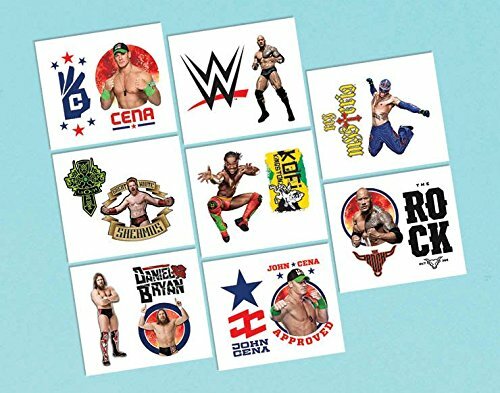 Colorful WWE stickers featuring Edge, John Cena, UnderTaker and other favorite WWE wrestlers. The perfect gift for any WWE or wrestling fan! Show your love of wrestling with WWE rubber bracelets. 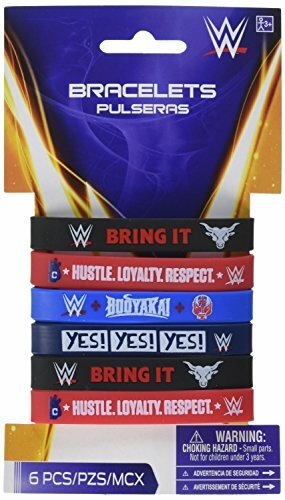 WWE wristbands feature phrases from favorite WWE wrestlers, including Daniel Bryan, Rey Mysterio and Dwayne The Rock Johnson. Keep all four or share with friends! These wrestling wristbands are perfect party favors or treat bag stuffers for a World Wrestling Entertainment themed birthday party!. Our Own The Mat - Wrestling - Candy Bar Wrapper Birthday Party or Wrestler Party Favors are an excellent choice for a great party favor - who doesn't love chocolate?! These wrappers are sold in sets of 24 and printed on premium-grade paper with a photo-like shine that's made in the USA. Each one comes with a special message on the front and cute "nutrition facts" on the back. Your guest won't be able to stop themselves from smiling! They are designed specifically for Hershey's 1.55-ounce candy bars, and include the foil wrapper too. Our candy bar wrappers are easy to make, impressive to give and delicious to eat! 12 Personalized WWE World Wrestling Entertainment Birthday party favor tags! 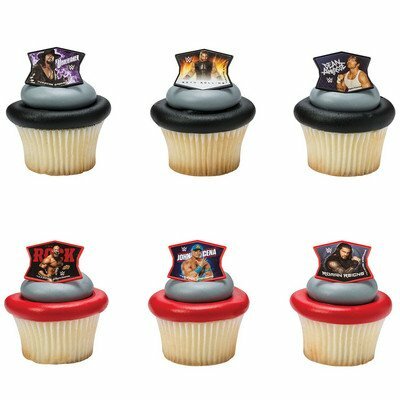 WWE Party-Favors at WAL-MART! Second Channel EXCLUSIVE!